The Ainu are a race of people living on the northernmost island of Japan, Hokkaido. Until the 1920's the lips and mouth of their single women was tattooed with broad blue bands that looked much like mustaches. 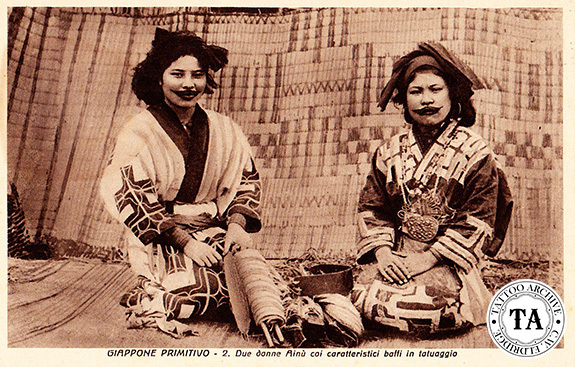 The young Ainu women underwent this tattooing between the ages of 11 and 21. The lips were washed with a boiled solution of birch bark and clear water and the grandmothers or maternal aunts began the pricking with a razor sharp sliver of metal. They wiped the blood away with a cloth saturated with the bark broth and rubbed birch wood soot from the bottom of the cooking kettle into the cuts. This gave the tattooing its blue color and, coming from the sacred fire, it was believed to protect the wearer from evils entering the mouth and nose. 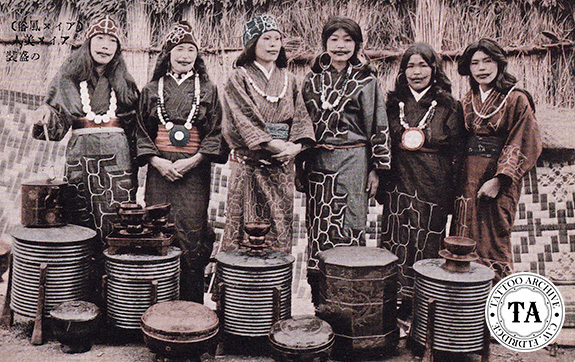 Although tattooing was banned in Japan in the 17th century, the people of pure Ainu strain ignored this law and continued this traditional tattooing.